My latest estate sale find is definitely in the category one man's trash is another man's treasure. That Sunday I went to two sales, both were picked clean and I was pretty bummed out that I couldn't snag a cheap big pot. Getting a pot for cleaning up the hardware of the old door I stripped was the only reason we went to the sales, luckily they were in close proximity to each other. Then I saw the stool and although the seat was broken I had a vision of making my own seat for it. I already bought some rope and am playing around with ideas. Once the stool is finished it will make an appearance in the mini makeover category. At the same sale they had an old workbench that would have made an amazing island in someones kitchen but it was too big for our car so it had to stay behind. Maybe I need to invest in a van or a trailer? ;) Still looking for a cheap pot though, might have to try Target or other places because I want to hang the door again before my parents arrive next month. Is anyone else working on a cool project? I know that Christine of The Plumed Nest is working on the desk she found on the curb. Can't wait to see what she did with it. You need a truck! Neel needs a truck too. Our Mini Cooper is on her last legs (I know, I drove her yesterday! ), but he drives SO little, that we're waiting until the very, very end to make another purchase. That stool is a beautie! For me it gives bit of an asian vibe. If you get a van, you will be in lot of trouble with projects just lining up in your basement :D Too bad about the pot, I would have assumed those would be available anywhere. I do have one project waiting. It's two chest of drawers, now waiting in my boyfriends parents, bit afraid to start those actually. Because if the baby is born before those are done, then it might take forever for me to get back on them. 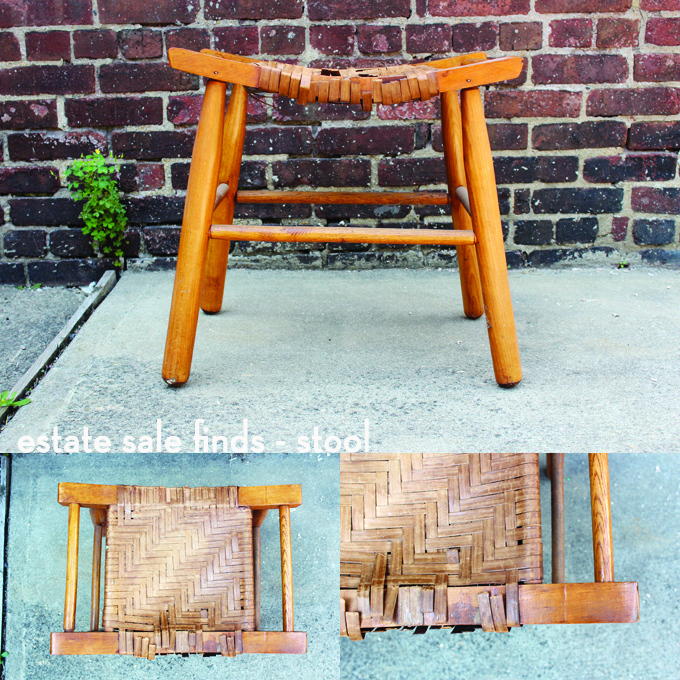 i love this little stool and can definitely see rope looking really good on it. though that sounds really difficult to me. i guess maybe you would use a staple gun? I would definitely have to use a staple gun for this project, tried to weave the rope around the chair and the result looked pretty but was not functional at all. I would like for people to sit on the stool and not just look at it. Yay for almost being finished with the desk. You go girl! I am always amazed by your finds because I would have walked right past this little gem. I imagine when we finally get to Aus and settle down, I will have a million projects! But for now, I am stuck with packing, packing and more packing! Nina the estate sale queen! The stool is great, can't wait to see what you're going to do with it. I think a van would be a good investment for the vintage furniture shop you should definitely open one day! I second Lena. You are the queen of estate sales! Excited to see the finished project!